The use of steelwork contributed to the client’s desire to build a house that was architecturally distinguished and environmentally sustainable. 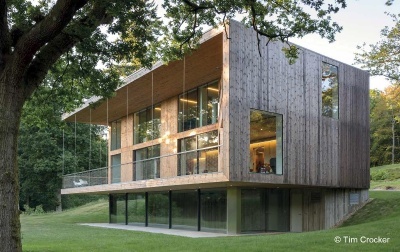 The steelwork structure was pared back to the minimum during the design process and this allowed the maximum amount of insulation to be incorporated into the external fabric of the house, while keeping the depth of its exposed edges to the minimum to add elegance to the drama of the suspended upper floors. The use of structural steelwork enabled the 15m clear span to be achieved at the lower ground floor level swimming pool, while providing floor-to-ceiling openings to the upper floors on the same elevation.